Ninjas are all about stealth and quietness, doing things without you ever knowing that he was there in the first place. This makes them perfect assassins, melting into the shadows and making it look as though they can come and go as they please. If you would want to have all the mad ninja skills but would also want the world to know about it, go join a circus instead. 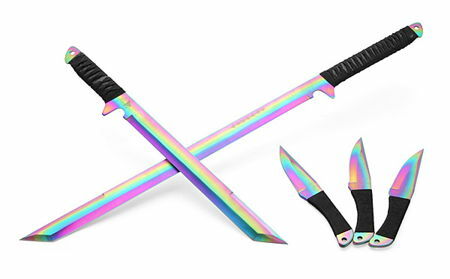 Alternatively, you can always pick up the Blades of The Rainbow Ninja collection, where it comprises of two sets of rainbow blades, making them perfect for Unicorn Ninjas. One set happens to feature a pair of swords, while the other showcases a trio of knives, where all these blades are titanium-coated stainless steel that boast all the colors of the rainbow.